This Polish jellied pigs feet recipe is known variously as zimne nogi (which literally means "cold legs"), studzienina, zimne stopy ("cold feet"), galareta z nóżek ("jelly legs"). Most Eastern Europeans come from an agrarian society, so nose-to-tail eating (now being espoused by modern gourmet chefs) is a way to survive the sometimes-difficult farming life. This recipe demonstrates an attempt to emulate the aspic-covered gourmet dishes of the aristocracy or szlachta. 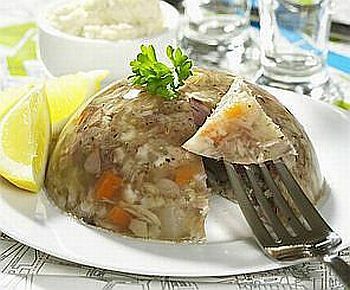 Jellied pigs feet exist in most Eastern European cuisines and in other parts of the world, especially the United Kingdom where they are known as trotters. In a large pot, place pigs feet and just enough water to barely cover them. Add peeled soup greens, bay leaf, peppercorns, allspice, garlic, and salt. Bring to a boil, skimming off any foam. Add pork loin, again bring to a boil, reduce heat, cover and simmer 1 1/2 to 2 hours or until feet meat is falling off the bones. Remove the meat from the water and debone it. Strain broth through gauze and place in a clean pot. Dice the cooked carrots from the soup greens and the meat into small pieces. Return diced meat and carrots to the broth along with marjoram and more crushed garlic and salt and pepper, if desired. Bring to a boil and add dissolved gelatin, stirring until well incorporated. Cool slightly and pour into pour into molds, small bowls or ramekins. Refrigerate overnight. When ready to serve, unmold onto a serving platter or individual plates. Garnish with greens or parsley, if desired, and serve with vinegar, horseradish, lemon, and marinated mushrooms to be used at the discretion of the diner. Moroccan Calves, Goat or Lambs Feet Recipe: This comfort-food specialty is not set in gelatin but is served warm with chickpeas, wheat berries, and raisins in a well-seasoned sauce.